Monkey Fartz: Duluth Police on the Lookout for "The Joker"
Duluth Police on the Lookout for "The Joker"
This week, a police substation in Duluth, MN discovered twelve marijuana plants growing outside its building in a concrete planter (article). 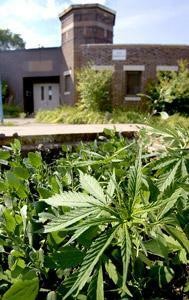 Police Lt. John Beyer believes the pot was planted by “a Joker” with a keen sense of irony. Beyer immediately formed a task force to hunt down the culprit. Lt. Beyer has since restricted future access to the “evidence”. Love your topping ideas! I’ve been making these for years as thumbprints with raspberry and apricot jam. Everyone expects them at holiday time! The recipe I use is for Rosenmunnar, or Swedish thumbprints.